If signing your name and credentials to a public petition on the subject means being serious, then Noam Chomsky’s tiny number begins at 2,100, not counting scientists and other professionals. Why would Chomsky make such an obvious exaggeration when he has been presented with contradictory facts many times? I’ve personally had over thirty email exchanges with Chomsky. In those exchanges, he has agreed that it is “conceivable” that explosives might have been used at the WTC. But, he wrote, if that were the case it would have had to be Saddam Hussein or Osama bin Laden who had made it so. Of course, it doesn’t matter how many professionals or intellectuals are willing to admit it. The facts remain that the U.S. government’s account for the destruction of the WTC on 9/11 is purely false. There is no science behind the government’s explanation for WTC7 or for the Twin Towers and everyone, including the government, admits that WTC Building 7 experienced free fall on 9/11. There is no explanation for that other than the use of explosives. The obviously bogus “tiny number” statement from Chomsky is only one of several such absurdities the man uttered in his lecture response. Here are a few of the others. I’ve copied Chomsky on more than two peer-reviewed scientific articles in mainstream journals that describe evidence for demolition at the WTC. Therefore he knows that this statement is not true. And I’ve given dozens of talks around the U.S. and Canada that focused on the WTC demolition theory, many of which were at universities. I’ve also pointed out that MIT’s civil engineering professor Eduardo Kausel made elementary mistakes in his public comments about the WTC disaster. Kausel claimed in Scientific American that the WTC towers were “never designed for the the intense jet fuel fires—a key design omission.” Kausel also claimed that jet fuel from the aircraft “softened or melted the structural elements—floor trusses and columns—so that they became like chewing gum.” At the risk of making a Chomsky-like exaggeration, I’ll venture that nearly everyone today knows that these statements are false. Chomsky went on in an attempt to belittle, and downplay the sacrifices of, people seeking the truth. Chomsky knows that I was fired from my job as Site Manager at Underwriters Laboratories for publicly challenging the government’s investigation into the WTC tragedy. He knows that many others have suffered similar responses as well, including Brigham Young University physicist Steven Jones and University of Copenhagen chemist Niels Harrit, who were forced into retirement for speaking out. And although everyone knows that researchers and universities today depend on billions of grant dollars from the government, Chomsky implies that such funding could never be impacted in any way by questioning of the government’s most sensitive political positions. 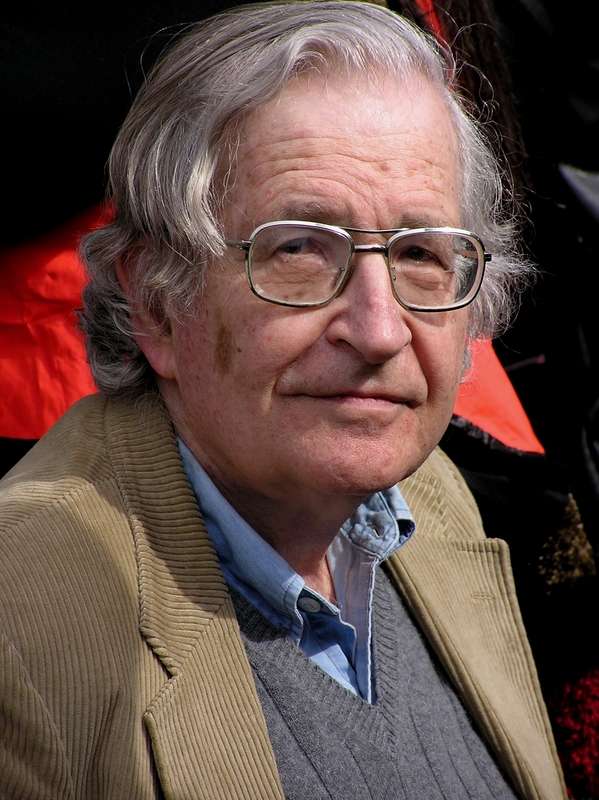 The “hour on the internet” nonsense is ludicrous, of course, and Chomsky knows it well. Jones and Harrit have better scientific credentials than some MIT professors and we have all spent many years studying the events of 9/11. I’ve spent over a decade, and have contributed to many books and scientific articles, on the subject. Pandering to the hecklers in the crowd, Chomsky summarized his simplistic (public) position on the events of 9/11. #2—They didn’t blame 9/11 on Iraqis, they blamed it on Saudis—that’s their major ally. Basically, these three “overwhelming” reasons boil down to one reason—Chomsky assumes that if the Bush Administration was involved it would have immediately blamed Iraq for 9/11. Of course, Bush Administration leaders did immediately blame Iraq for 9/11 and they did so repeatedly. That was one of the two original justifications given by the Bush Administration for invading Iraq. Therefore, Chomsky has either ignored the response to his one major concern for several months or he knows that his concern is no longer valid. What would make him feign ignorance in such a way? Perhaps it is the fact that he would lose a great deal of face if he were to finally admit that there is much more to the story of 9/11. Regardless, when a tiny number begins at 2,100 and “just overwhelming evidence” to exonerate the Bush Administration boils down to one bad assumption, we are again reminded of the power that 9/11 holds. When presented with substantial evidence for complicity on the part of corporate and government leaders, the obvious becomes either undeniable or an emotional cue to dissemble.